With this being Exotics and Luxury Month I think this is one of the best cars that we could possibly have featured from Japan. 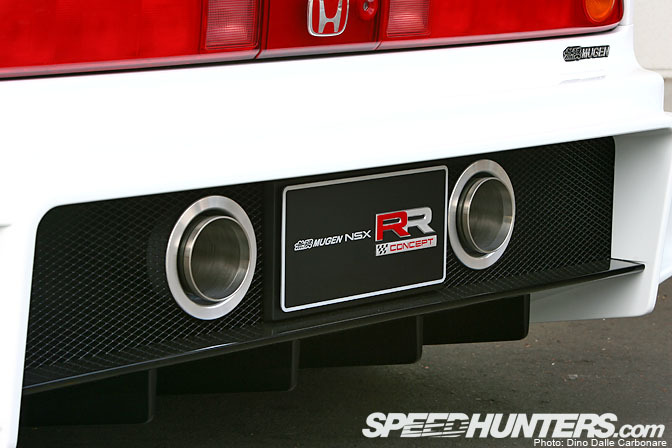 If you thought the NSX-R was the ultimate car from Honda, just check out what Mugen have done! Some of you may recall having seen the NSX “double-R” Concept in the Tokyo Auto Salon coverage but this is one of those cars that deserves a more detailed feature. So a couple of weeks after the show I met up with Kim-san over at Mugen in Saitama-ken, ready to drool over this beautiful creation. 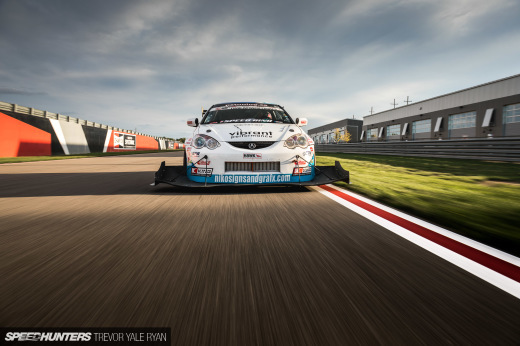 Every car-nut’s dream is to create a road-going race car a favorite sports car. Well Mugen did just that with the NSX-RR, taking styling cues from the NSXs that still compete in the Super GT, four years after production ended! In fact there are currently five teams using the NSX in the GT500 class! To create a the most extreme road-going version of the NSX-R, the guys at Mugen began with the exterior, creating an impossibly aggressive wide-body conversion. The center intake features a series of air guides to direct the air to the front-mounted radiator as well as the brakes. The hot air passing through the radiator core is then expelled via the louvered outlets on the hood while the protruding front lip helps keep the front end planted at speed. The front and rear fenders have been pumped considerably, increasing the NSX’s width by a massive 15 cm. 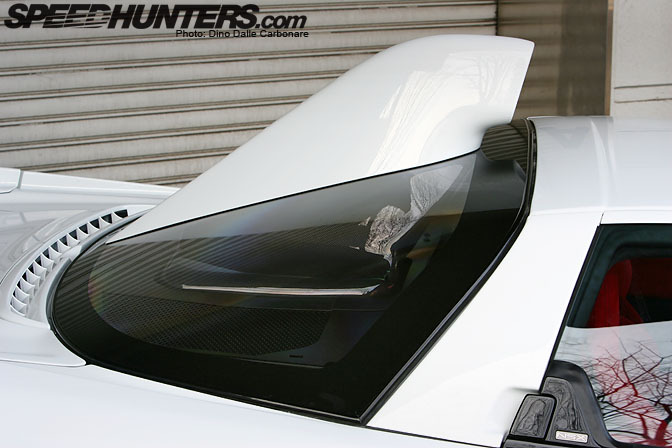 In true Super GT style a roof scoop has been worked into the rear windscreen to help feed cool air to the mid-mounted C32B. Just look at that rear view? Imagine seeing an NSX like this on the road, you would run away crying! 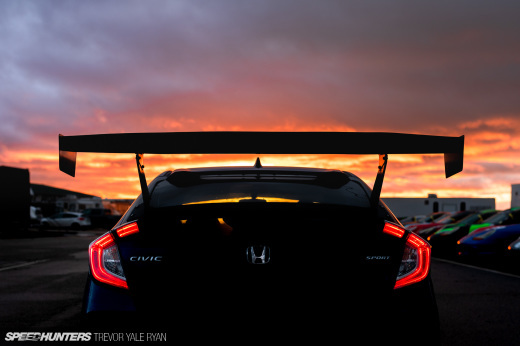 This must be the only GT wing to have been fitted with a third brake light! 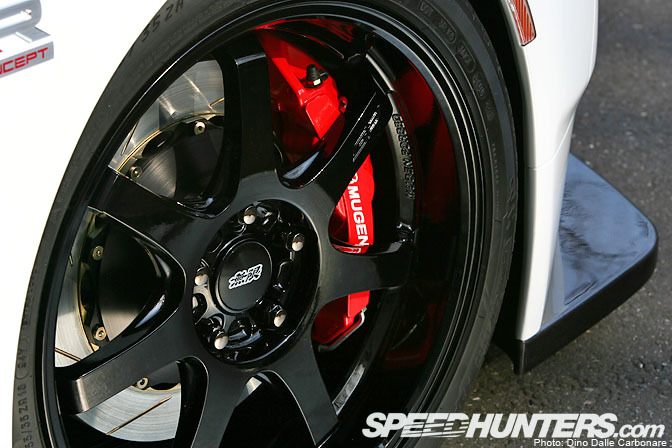 Joining the black 18-inch Mugen forged wheels is an upgraded braking package with is made up of massive 6-pot monoblock calipers up front and 4-pot calipers at the rear. These bite down on 2-piece slotted floating discs. The wheels are wrapped in Michelin Pilot Sports, 255/35/ZR18 front and a massive 335/30/ZR18 out back ! Here is a closer look at that air scoop, looks very similar to the one fitted to the Limited Edition NSX-R GT road cars that were built back in 2005 for Super GT homologation purposes. I really like how they have integrated the rather large exhausts into the center of the grilled area, allowing a clean diffuser design. …providing plenty of air to the 3.2 L V6. Hey but wait a second! What is going on here? The C32B is mounted longitudinally!! Mugen wanted to extend the Super GT connection even further and so turned the engine 90º counterclockwise and mounted it like God intended! 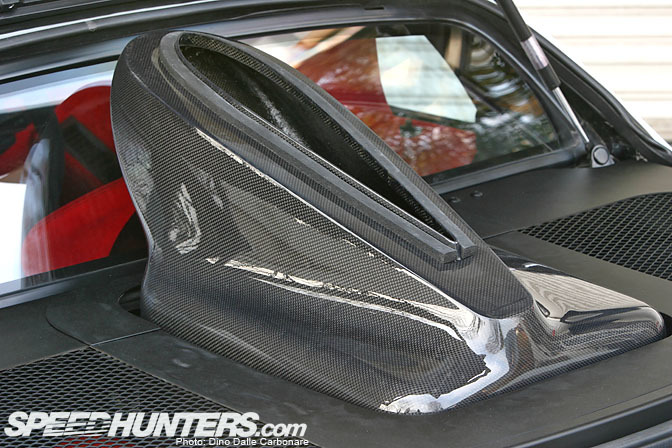 This is by far the coolest detail of this NSX “double-R”, but it is also what makes it a Concept. You see the longitudinally mounted engine in the GT cars is joined by 6-speed sequential transaxle transmission, something that was obviously too expensive to fit to, what is essentially, a one-off project. So the NSX-RR is a non-runner, there is no gearbox, and if you stick your head far enough into the engine bay you will also notice there are no headers, and no exhaust system. The interior is a work of art, Mugen have managed to take what was a very simple, yet aging cockpit and transform it into something very futuristic. To do this pretty much everything was covered in soft, red suede, while the seats and door cards get black suede inserts. To add a more modern touch, the stock NSX-R steering wheel has been replaced with a Civic Typer-R unit. Check out the carbon spokes and the suede rim. I think I need sunglasses to look at this shot for more than a few seconds! Bringing the center console up to date is a set of new switchgear designed to control the navigation, A/C and audio set-up. Nothing actually works, it is all for show. 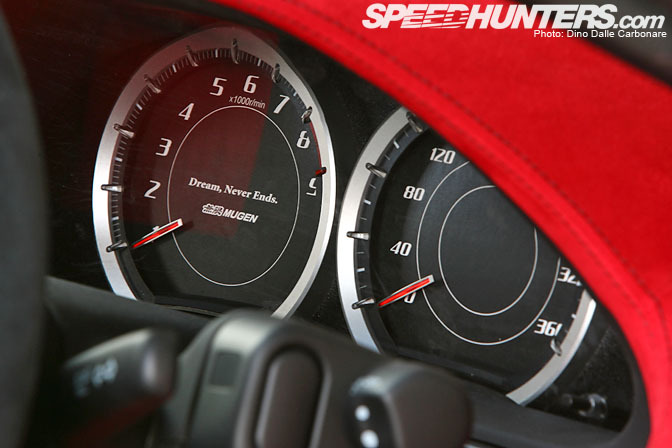 The integrated navigation/LCD screen only shows the NSX-RR Concept logo. Even the main instrumentation has been redesigned with a very simple set of dials. Talking to the guys at Mugen they mentioned there might possibly be a very slight, miniscule chance, that the NSX-RR gets produced in a small limited edition run. If there is a lot of interest what they could do is find well maintained NSX-Rs in the second hand market and build the cars at Mugen, pretty much what Nismo did a few years ago with the Z-tune BNR34s. One thing is for certain though, if the NSX-RR does happen, the engine position will most definitely stay transversal as those 6-speed sequential transmissions are a bit on the expensive side, not to mention quite unrefined! Interior is NICE and HOT. It's a masterpiece! C32B in longitudinal impressed me..
Btw, nice shots as usual Dino! Non-runngin!? Aw man!! It needs to happen NOW, this is just too sick of a car to keep in the "what if" stage. When I would have a million dollar, I would spend all my money to complete this car, so it can hit the road! Like mentioned before, the longitudinally-mounted engine is just a work of art; however, the red interior is just aweful....way too much red. Its a car that has no means of propulsion. Someone alert Jeremy Clarkson, we've found a car that can be art. This has to be the best NSX I have ever seen, and that Civic steering wheel looks so perfect finished in Carbon! If these are put on the production line, somebody has to do the engine as it has been shown here, it's too good to not do! Words can't describe how I feel about this car. why i can only spotted one pedal on the 14th picture? Too extreme for my taste, I don't like the interior either. i think this is the best mugen honda ever... hot! Good to see the scoop is not fake like the one on the R version. Also this interior is stunning. hahaha.. big upset, its not the REAL THING! That red would burn my eyes. Desktop of... all of them? desktop all of them agreed. I would think the winning combination is to replace the Honda V6 with a Mercedes V8. If it can work for Brawn, why not the NSX. Oh Honda, you so silly. pity it's a non runner. seeing as it's just a one off concept surely they could have afforded the transaxle box.. would just make it that much cooler. wow, i saw this a while ago on supercars.net, but it still leaves the same impression, and it always will, what a masterpiece, in my books, one of the best looking cars ever made, i just wish they would make a working version, maybe with twin superchargers? sweet. In the June Super Street this very car has a gearbox and an exhaust system fitted acording to the author of th article. This car gives me the horn. What an AMAZING piece of art. Yea, for the first time ever, wallpaper request for every single freakin photo in this post! Awesome work Dino! i've always been a fan of the NSX and although this is a really nice concept i feel it is time to move on as there is only a certain amount of time you can keep this body shape.When is the replacement due? Would've been better if they managed to get the car running. Also could switched the interior color (black with red accent) and a proper new steering wheel. Another vote for desktop wallpapers!! John, the replacement was cancelled a while back. Real shame, I saw it testing at the Ring and it was quick, and sounded immense. ???? ?? ???? ?????? ???????????!! ? ? ?????? ?????????? ?- ??? ????????? ?????? ??????????? ?????! ???? ?, ???? ?, ????? - ??? ????? ?? ???????? ? ?????? ???? ?? ??????? ?- ??????? ??????????? ????? ???????? ?? ???! Hot thing. just needs some body work, because to me the body ain't really that smooth. Especially, what I personally REALLY hate is this roof scoop. Looks so ugly to me. But nothing bout the interior, it's like blowing eeeverything I saw before away! ????????-?? ????? ???? ????????????? ???????! ??? ???????? ?? ??????? ????! HOT as ........ If i had the money i would buy!!!! Mugen have got to buy low kilometer NSX preferably the 2002-2005 models and make this NSX RR come true. 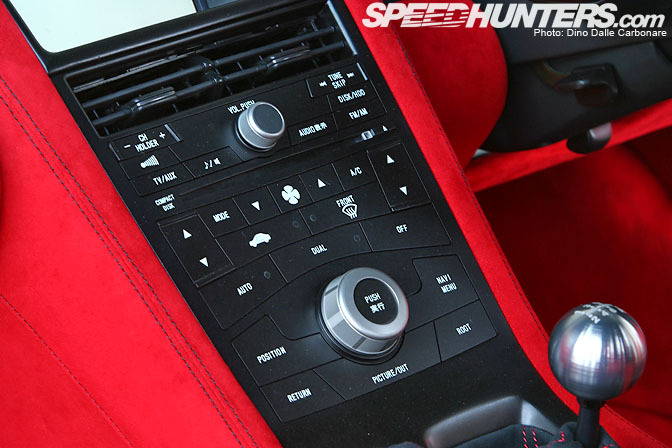 The interior is awesome, the red colour is so vibrant and gives is an excellent atmosphere. Just needs a fuel and temperature gauge somewhere on the tachometer. I loved the widebody in this car as it makes it feel that your owning a GT NSX thats been used in the racetrack. Overall the widebody is unique feature in the NSX road models and it's AWESOME. It would be nice to find a way to put the supercharger or a turbocharger somewhere but the naturally aspirated engine is fine as the air scoop is needed to function properly. If it's going to be naturally aspirated, then try using a 3.4 L JGTC NSX engine. Overall this is an excellent car. Just hope sometime Mugen would be able to produce this awesome car soon using secondhand low kilometer NSXs soon. Cheers to Mugen if they do produce it as this will be the best car they will make.